The policy discussion over immigration into the United States has been in constant gridlock for nearly three decades. Focusing primarily on issues of illegal immigration and border entry and undocumented aliens in the United States, Congress passed significant legislation in 1986 and 1996 that was unsuccessful in slowing the flow of illegal immigrants. It then deadlocked over a third attempt in 2007. Yet U.S. immigration policy is rooted in a broader context that has not been addressed in these debates. Illegal immigration has distinct foreign policy dimensions --the "push" factor that leads immigrants to leave their countries in the first place has been entirely overlooked. Overhauling the U.S. regime for legal immigration has received insufficient attention --a necessary task if the United States is to continue attracting talented immigrants and maintain a technological and economic lead in the world. This report examines immigration into the United States in a foreign policy context. It broadens the debate by analyzing issues of economic competitiveness, terrorism and national security, human rights, and public diplomacy in the context of globalization. 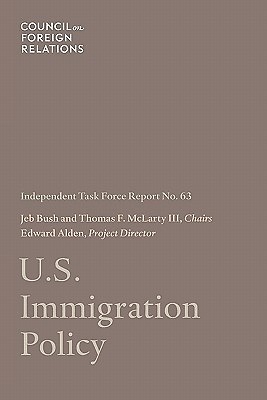 The report then offers recommendations for a twentyfirst-century immigration policy that serves U.S. economic, diplomatic, and national security interests.